So many people within the Facebook groups I'm in, or on Instagram are often asking "What Grimm's product would you suggest to get started?". Well, mine began way back in 2015 and I've been gradually adding items piece by piece. As you probably know, there's a lot to choose from! 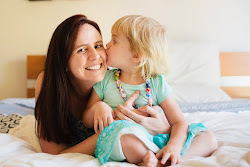 So let me share with you where our collection started and what my latest purchase was, and most importantly, where you can get them from here in Australia! Disclaimer: Some of these items have been gifted to me by various brands over the years, and some I've purchased myself. Grimm's really is my most favourite wooden toy brand. The quality is beyond belief. This is not a sponsored post. 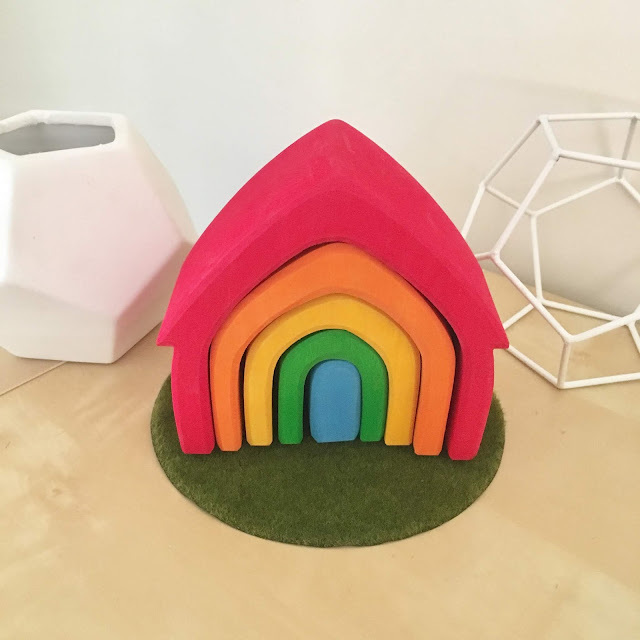 My first item was the medium rainbow for Miss M's transformation to a big girl rainbow themed bedroom. 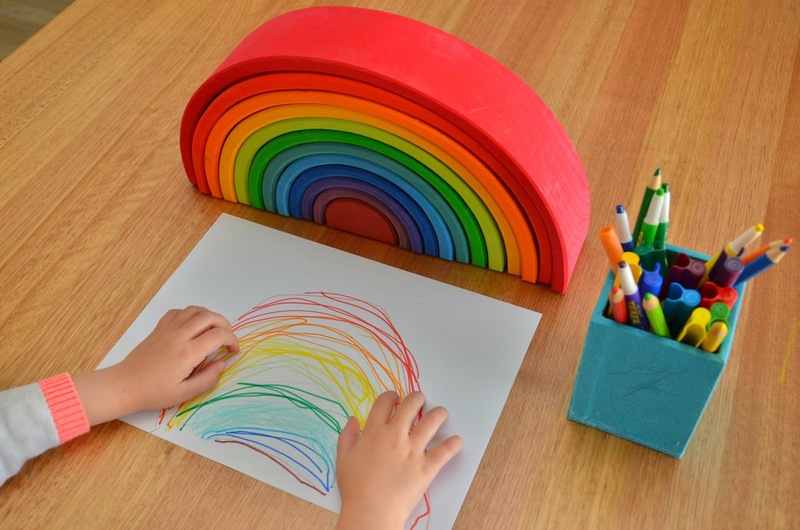 If you're considering getting a rainbow (Grimm's signature toy) have a think about whether you want small (11cm), medium (17cm) or large (38cm) and which colour combination you want. If you want to use for small world play, then the small would be ideal. But if you want it for large scale block construction - go large. Next I got the stacking bowls (pictured below - the mushrooms to the left came later). These have a lot of great potential for ordering by size, stacking, nesting and colour sorting. They have been used for both kids every since I got them three years ago and still going strong. Miss M even used them today to trace circles around for a mandala pattern she wanted to create. After seeing how much we loved the medium rainbow - I knew I wanted to get my hands on the large one! 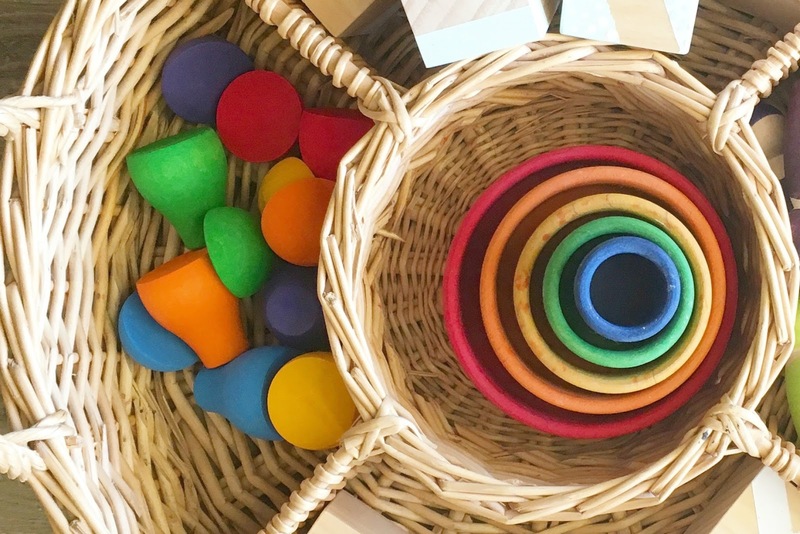 I was lucky enough to be gifted the large rainbow by Brianna at The Creative Toy Shop when I shared this blog post - why I believe every classroom NEEDS one of these! Check it out here. Another awesome collaboration with The Creative Toy Shop lead to our Peg People on Tour Challenge with the 12 Rainbow Friends. So much fun! These are another Grimm's item which have been used so much at home and at school for imaginary play. Perfect for a dolls house and small worlds. They're currently quite comfortable on our transport themed discovery table in our classroom and are played with on a daily basis. So I mentioned the mushrooms earlier, and here they are again. 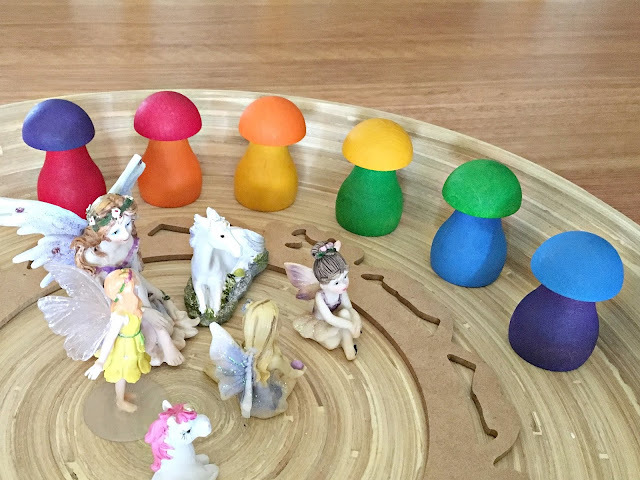 The idea is that the children have to match the mushroom tops to the stalks. Another cute addition to fairy worlds and small world gardens. Great for colour matching for toddlers too! I'm pretty sure I ordered the forest trees at the same time as the mushrooms because I thought they would work so well together. 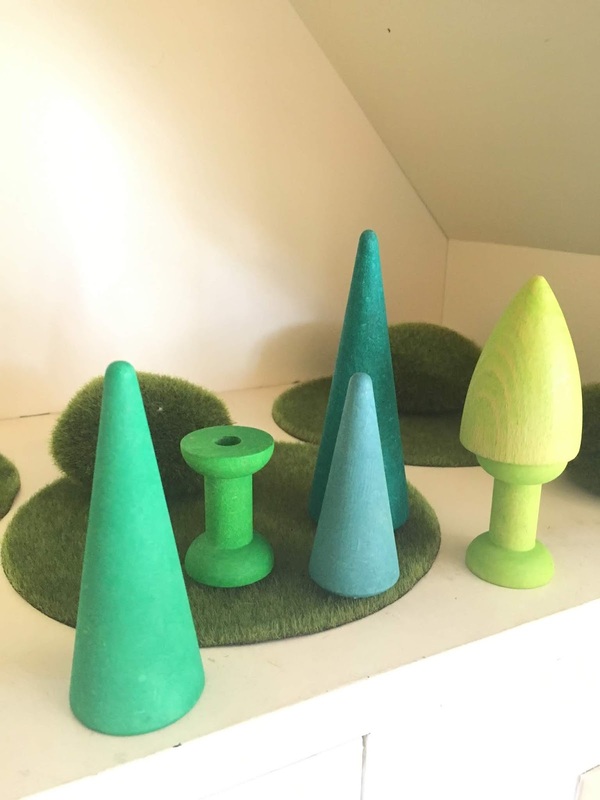 There's also a green ball that comes with this set which can be used in many different ways. 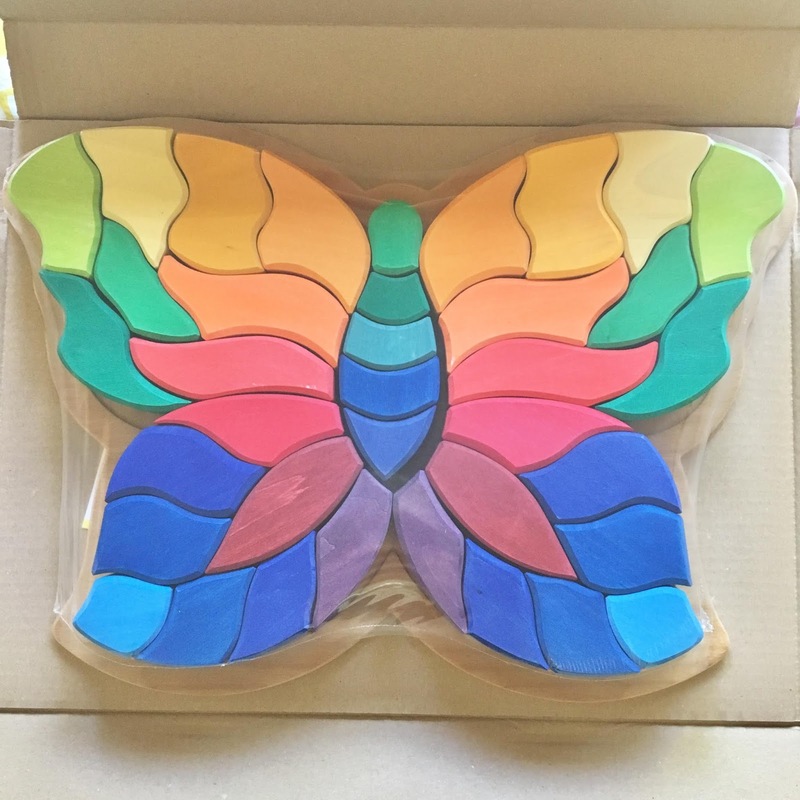 The large butterfly puzzle was actually more challenging that I expected it to be. It really is spectacular to look at - but takes a lot of patience and persistence to put back together. Because each piece could either be up or down, left or right, there are really four different possibilities and only one correct place. I was thinking of printing and enlarging a photo of it to place on the board as a guide underneath. However - we've been using it in the classroom lately as open ended block play. It's so interesting to see the constructions the children come up with with irregular shaped blocks! If I were to confess my favourite Grimm's product it would have to be the pebbles. My friends at The Creative Toy Shop can never keep them in stock for very long they are so popular! I started off the moss (because, favourite colour).... but it wasn't long until I had the full set! (Keep reading). 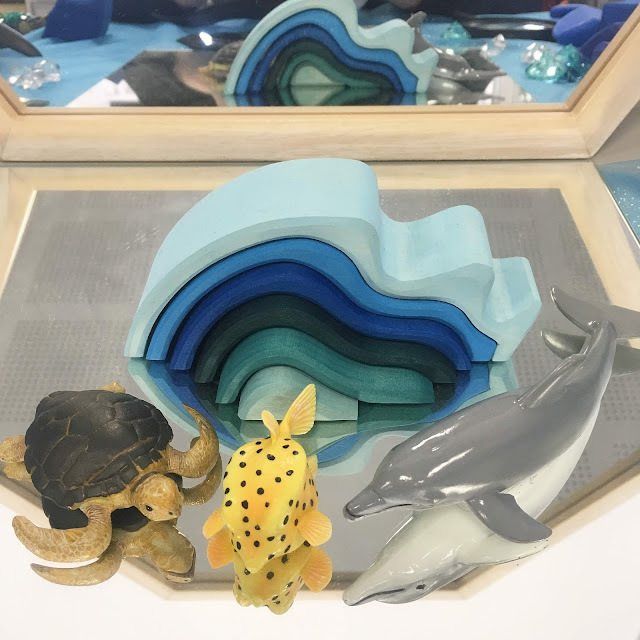 To suit our ocean theme in Term 2 of this year I got the small waves stacker - but I kind of wish I got the medium as this one wasn't quite big enough for the discovery table. Would be great for the Kmart play tray though! The gems are another personal favourite of mine. 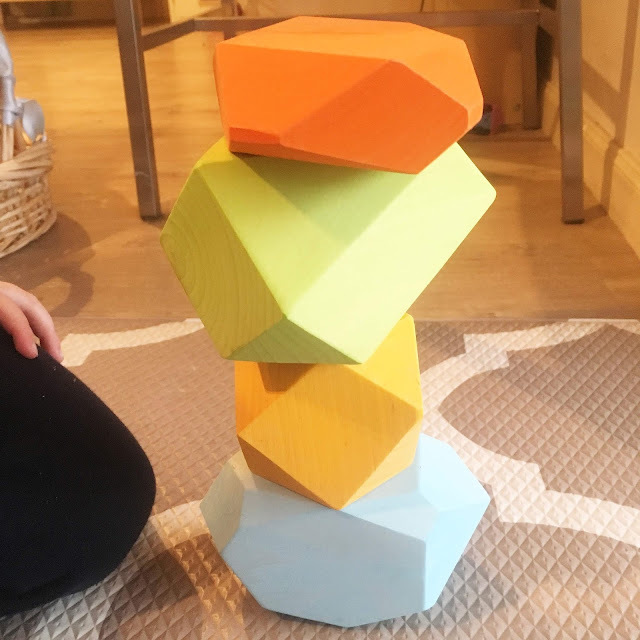 They're a beautiful addition to our wooden blocks. These beauties haven't made their way into school yet but I'm sure I'll find a use for them one day! As I said I ordered the river and fire pebbles to complete the set and these have been played with so much! I also managed to score the limited edition purple "dream" pebbles at a local market - what luck! If you want to get your hands on these - be sure to get them as soon as they are in stock because they don't last long. My latest purchase making it number 14 in my Grimm's collection is the house stacker. I actually got this one from Oskar's Wooden Ark, a relatively new business based here in Adelaide (which saves me on postage!). So what's next I hear you ask? What's on my wish list? I'd love to complete the elements collection by adding fire and caves. Also there's limited edition violet gem, I'm working towards getting the hearts by Valentines Day next year and would LOVE the semicircles to add to the large rainbow stacker and open up the ways it can be used even more. As I said at the start of this post, this collection has been a very gradual process. We couldn't afford to buy everything in one go! Please head over to Instagram and share with me, what was your first Grimm's purchase? Beautiful!!! May I ask where you found the little moss-looking green mats and pretend "bushes" that are in some of the photos on this post? They're so cute and useful!